Martha Conant Karoff died peacefully and with grace at her home in Santa Barbara, CA, on September 3, 2015, at the age of 79. Martha was supported during an extended period of declining health by the love of her family – seventeen strong – and her many, many friends in Santa Barbara, in West Newton and Boston, MA, and beyond. Martha was born in Keene, New Hampshire to Kenneth G. Conant and Mary Ellen Hartnett Conant. Martha graduated with honors from Keene High School and attended Brandeis University (’58), where she met and married her husband of 58 years, Peter Karoff, who survives her. Martha was the first woman president of the Neighborhood Club in West Newton, and the founding board chair of New Repertory Theatre in Watertown MA. In 2014, to celebrate its 30th anniversary, New Rep established the Karoff Award for Lifelong Leadership, with Martha as its first recipient. Part of her New Rep legacy was it’s first-ever fundraiser, with a scene from A.R. Gurney’s The Dining Room, staged around Martha’s dining room table. 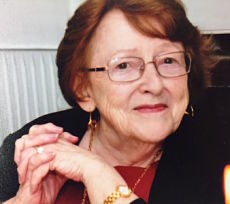 Martha was known as the “unofficial Mayor” of West Newton Hill, and served on the board of the All Newton Music School, and the New Arts Center. In Santa Barbara, Martha was a member of the CAMA Woman’s Board and Social Venture Partners. She participated over many years in several spirited book and bridge clubs on both the East and West coasts. For Martha, family was everything, and gatherings over Christmas and Thanksgiving – often with 30 + at the table – along with years of glorious summers on Martha’s Vineyard and Chappaquiddick, made for great joy and enduring memories. At one especially memorable night in 1985, Martha was given a surprise party celebrating her 100 Years of Motherhood. Other standouts were annual Halloween parties in West Newton, where, for forty years, Martha and Peter served popcorn and cider to what grew to more than 700 trick-or-treaters. She will always be remembered by her children and grandchildren for demanding, but never getting, Christmas lists before Halloween. Martha had a remarkable authenticity as a person who cared, listened to others, and was an empathetic and gifted friend, leader and mentor. She will be deeply missed by Peter, her daughters Deborah Ann Karoff of Santa Barbara, CA, Lorinda Karoff of Brooklyn, NY, Rebecca Karoff of Madison, WI, and son Thomas Michael Karoff of Armonk, NY, and their devoted spouses, Anna DiStefano, Jeffrey Younger, Brad Wolbert, and Pamela Furtsch. Martha was in awe of the accomplishments of her children, and immensely proud of her seven talented grandchildren ranging in age from 7 to 23: Lauren, Sarah, and Devon, Sophie and Jacob and Emma and Kaeli. Martha also leaves behind her brother- and sister-in-law, Richard M. Karoff and Sandra Manzella, along with nephews, and their wives and children, and a sister, Betsy Conant Drouin and brother-in-law Raymond Drouin, and their children. She dearly loved her family, her home, her community, art, music, wooden jigsaw puzzles, and knitting gorgeous sweaters. Most of all she loved her life with her soul mate of 58 years, Peter. And all those roses that tell of being and loving a wife. A celebration of Martha’s life will be held on October 17, 2015, in Santa Barbara, and on November 21 in West Newton. To share a memory or leave an online condolence, please visit www.wrhsb.com. Details on the October 17 and November 21 celebrations will be posted there in coming weeks.